Fig. 1 - Cartesian coordinate system. 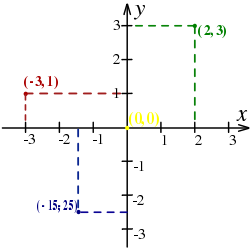 Four points are marked: (2,3) in green, (-3,1) in red, (-1.5,-2.5) in blue and (0,0), the origin, in yellow. In mathematics, the Cartesian coordinate system (or rectangular coordinate system) is used to determine each point uniquely in a plane through two numbers, usually called the x-coordinate and the y-coordinate of the point. To define the coordinates, two perpendicular directed lines (the x-axis or abscissa, and the y-axis or ordinate), are specified, as well as the unit length, which is marked off on the two axes (see Figure 1). Cartesian coordinate systems are also used in space (where three coordinates are used) and in higher dimensions. Fig. 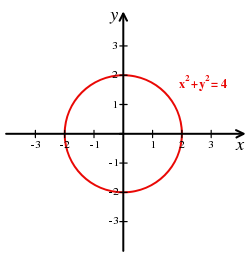 2 - Cartesian coordinate system with the circle of radius 2 centered at the origin marked in red. The equation of the circle is x² + y² = 4. Using the Cartesian coordinate system, geometric shapes (such as curves) can be described by algebraic equations, namely equations satisfied by the coordinates of the points lying on the shape. For example, a circle of radius 2 may be described by the equation x² + y² = 4 (see Figure 2). Cartesian means relating to the French mathematician and philosopher René Descartes (Latin: Cartesius), who, among other things, worked to merge algebra and Euclidean geometry. This work was influential in the development of analytic geometry, calculus, and cartography. The idea of this system was developed in 1637 in two writings by Descartes. In part two of his Discourse on Method, Descartes introduces the new idea of specifying the position of a point or object on a surface, using two intersecting axes as measuring guides. In La Géométrie, he further explores the above-mentioned concepts. Fig. 3 - The four quadrants of a Cartesian coordinate system. The arrows on the axes indicate that they extend forever in their respective directions (i.e. infinitely). A Cartesian coordinate system in two dimensions is commonly defined by two axes, at right angles to each other, forming a plane (an xy-plane). The horizontal axis is normally labeled x, and the vertical axis is normally labeled y. 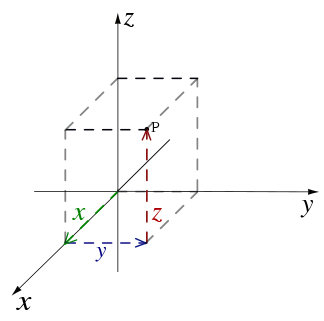 In a three–dimensional coordinate system, another axis, normally labeled z, is added, providing a third dimension of space measurement. The axes are commonly defined as mutually orthogonal to each other (each at a right angle to the other). (Early systems allowed "oblique" axes, that is, axes that did not meet at right angles, and such systems are occasionally used today, although mostly as theoretical exercises.) All the points in a Cartesian coordinate system taken together form a so-called Cartesian plane. Equations that use the Cartesian coordinate system are called Cartesian equations. The point of intersection, where the axes meet, is called the origin normally labeled O. 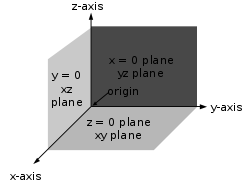 The x and y axes define a plane that is referred to as the xy plane. Given each axis, choose a unit length, and mark off each unit along the axis, forming a grid. 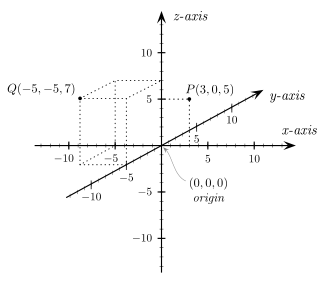 To specify a particular point on a two dimensional coordinate system, indicate the x unit first (abscissa), followed by the y unit (ordinate) in the form (x,y), an ordered pair. The choice of letters comes from a convention, to use the latter part of the alphabet to indicate unknown values. In contrast, the first part of the alphabet was used to designate known values. An example of a point P on the system is indicated in Figure 3, using the coordinate (3,5). Fig. 4 - Three dimensional Cartesian coordinate system with y-axis pointing away from the observer. Fig. 5 - Three dimensional Cartesian coordinate system with the x-axis pointing towards the observer. The three dimensional Cartesian coordinate system provides the three physical dimensions of space—length, width, and height. Figures 4 and 5, show two common ways of representing it. The three Cartesian axes defining the system are perpendicular to each other. The relevant coordinates are of the form (x,y,z). As an example, figure 4 shows two points plotted in a three-dimensional Cartesian coordinate system: P(3,0,5) and Q(−5,−5,7). The axes are depicted in a "world-coordinates" orientation with the z-axis pointing up. The x-, y-, and z-coordinates of a point can also be taken as the distances from the yz-plane, xz-plane, and xy-plane respectively. Figure 5 shows the distances of point P from the planes. The xy-, yz-, and xz-planes divide the three-dimensional space into eight subdivisions known as octants, similar to the quadrants of 2D space. While conventions have been established for the labelling of the four quadrants of the x-y plane, only the first octant of three dimensional space is labelled. It contains all of the points whose x, y, and z coordinates are positive. The z-coordinate is also called applicate. The usual way of orienting the axes, with the positive x-axis pointing right and the positive y-axis pointing up (and the x-axis being the "first" and the y-axis the "second" axis) is considered the positive or standard orientation, also called the right-handed orientation. Regardless of the rule used to orient the axes, rotating the coordinate system will preserve the orientation. Switching the role of x and y will reverse the orientation. Fig. 7 - The left-handed orientation is shown on the left, and the right-handed on the right. Fig. 8 - The right-handed Cartesian coordinate system indicating the coordinate planes. Once the x- and y-axes are specified, they determine the line along which the z-axis should lie, but there are two possible directions on this line. The two possible coordinate systems which result are called "right-handed" and "left-handed." The standard orientation, where the xy-plane is horizontal and the z-axis points up (and the x- and the y-axis form a positively oriented two-dimensional coordinate system in the xy-plane if observed from above the xy-plane) is called right-handed or positive. Different disciplines use different variations of the coordinate systems. For example, mathematicians typically use a right-handed coordinate system with the y-axis pointing up, while engineers typically use a left-handed coordinate system with the z-axis pointing up. This has the potential to lead to confusion when engineers and mathematicians work on the same project. 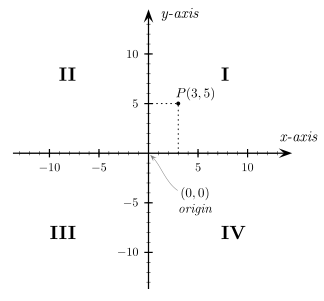 Figure 7 is an attempt at depicting a left- and a right-handed coordinate system. Because a three-dimensional object is represented on the two-dimensional screen, distortion and ambiguity result. The axis pointing downward (and to the right) is also meant to point towards the observer, whereas the "middle" axis is meant to point away from the observer. The red circle is parallel to the horizontal xy-plane and indicates rotation from the x-axis to the y-axis (in both cases). Hence the red arrow passes in front of the z-axis. Figure 8 is another attempt at depicting a right-handed coordinate system. Again, there is an ambiguity caused by projecting the three-dimensional coordinate system into the plane. Many observers see Figure 8 as "flipping in and out" between a convex cube and a concave "corner." This corresponds to the two possible orientations of the coordinate system. Seeing the figure as convex gives a left-handed coordinate system. 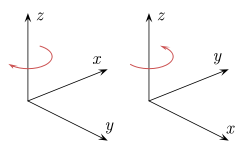 Thus, the "correct" way to view Figure 8 is to imagine the x-axis as pointing towards the observer and thus seeing a concave corner. The above discussion applies to Cartesian coordinate systems in mathematics, where it is common to not use any units of measurement. In physics, it is important to note that a dimension is simply a measure of something, and that, for each class of features to be measured, another dimension can be added. Attachment to visualizing the dimensions precludes understanding the many different dimensions that can be measured (time, mass, color, cost, etc.). Multi-dimensional objects can be calculated and manipulated algebraically. where , , and are unit vectors that point the same direction as the , , and axes, respectively. This notation is typically referred to as Cartesian notation. The unit vectors , , and are called the versors of the coordinate system, and represent an example of standard basis. In computer geometry, the Cartesian coordinate system is the foundation for the algebraic manipulation of geometrical shapes. Many other coordinate systems have been developed since Descartes. One common set of systems uses polar coordinates; astronomers often use spherical coordinates, a type of polar coordinate system. ↑ David J. Griffith (1999). Introduction to Electromagnetics. Prentice Hall. ISBN 0-13-805326-X. Descartes, René. 2001. Discourse on Method, Optics, Geometry, and Meteorology. Trans. Paul J. Olscamp. Indianapolis, IN: Hackett Pub. ISBN 0872205673. Gelʹfand, I. M., E. G. Glagoleva, and A. A. Kirillov. 1990. The Method of Coordinates. Boston: Birkhauser. ISBN 0817635335. Kline, Morris. 1985. Mathematics for the Nonmathematician. New York: Dover. ISBN 0817635335. History of "Cartesian coordinate system"
This page was last modified on 16 January 2017, at 17:27.